Our community engagement platform EVERY BODY MOVE (EBM) works to inspire and incite ambitious collective action fueled by the art of social dance. Built on our belief that social dance works as a powerful tool for social change, EBM brings the artistic rigor of Camille A. Brown & Dancers’ beyond the stage and into communities. EBM works to cultivate the creative capacity of its participants through innovative workshops, summer intensives, artistic encounters, educational experiences, public actions, and celebrations for people of diverse abilities, identities, and ages. 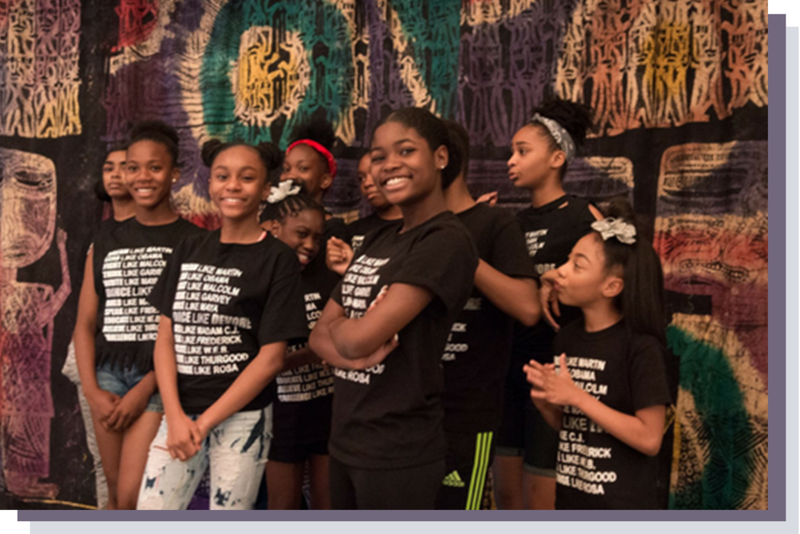 A 10-session experience in movement, self-empowerment, and creative action for Black girls and women. Read more. Launching spring 2018, BMM is an interactive experience exploring healthy masculinity, movement, and creative action for Black boys and men. Read more. BLM is an 8-session creative action residency designed to encourage families and communities to move and make art together. An immersive creative engagement for cultural workers, artists, and educators working for local change through extended artistic campaigns, organizing efforts, and projects. The Gathering serves as an open forum for intergenerational Black female artists to support one another and to advocate for greater cultural equity and acknowledgement in the contemporary dance world. Read more. EVERY BODY MOVE celebrates the power of creative citizenship. We see you, building thriving and interdependent spaces and communities. We see you, making art, volunteering, organizing, teaching, or growing food in neighborhood gardens. We know that EVERYBODY has a role to play in sustaining cultural vitality and creative action in our communities. We are celebrating how communities use their creative capacity to build the world they want to see. A world that honors EVERY BODY. We celebrate the myriad ways communities resist through brilliant, bold, and brazen practices of resilience. Join us for music, art-making, dance, poetry, and community-building. The time is now! EVERY BODY MOVE!!! EBM activities are made possible, in part, with support from the NoVo Foundation, Howard Gilman Foundation, Doris Duke Artist Performing Artist Awards program, Ford Foundation, Dance/NYC's Dance Advancement Fund made possible by the Ford Foundation, Harkness Foundation for Dance and Dance/USA's Engaging Dance Audiences. Engaging Dance Audiences is administered by Dance/USA and made possible with generous funding from the Doris Duke Charitable Foundation.